Many of you have been waiting for this email, and the stellar producers making wonderful Burgundies in the southern, cheaper postcodes certainly do deserve our attention. I sometimes wonder if they don't envy their more northerly colleagues with their higher prices and praise from the critics; and having to fend off requests for visits and freebies from journalists, influencers and vloggers. And then I think they probably don't. In the Côte Chalonnaise you are in La Bourgogne profonde. It isn't all about wine down here. The villages are further apart, the agriculture more mixed; time slows a little but meetings and tastings are brisk and purposeful. These are people with businesses to run. And boy, these are well-run domaines. You have everything that the Côte d'Or offers by way of terroirs, old vines, great viticultural practice and expressive winemaking. There's the same range of personalities and philosophies too. In Mercurey, contributing to that village's renaissance and rescue from the 'rustic' label it has laboured under for so long is the young - very young - Vincent Charton. He was at wine school with Fixin's Amelie Berthaut and shares her energy and fearless outlook. They both see potential to be realised; they're not smothered by history. 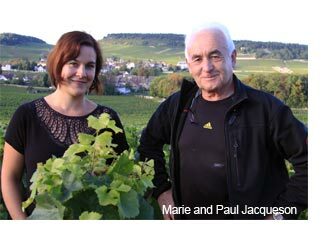 In Rully, Marie Jacqueson is very much at home with the newly acquired old vines in premiers crus adjacent to the family ones. She gives an impression of tradition but has a modern outlook. In Givry, the Lumpp family built their domaine from scratch and are hugely admired by their peers from all over the place. These are very serious wines with layers of complexity and like all three of today's producers make virtually compulsory additions to your cellar. Like the rest of this area the harvest was fairly small due to early season frost and flowering problems but value remains impressive.